(XL) Mens Vintage 70s Disco Shirt!! Tan, Magenta, Yellow & Green Plaid w/ Tiny Windmills! Home > Men's Vintage Shirts > Disco Shirts > (XL) Mens Vintage 70s Disco Shirt!! Tan, Magenta, Yellow & Green Plaid w/ Tiny Windmills! 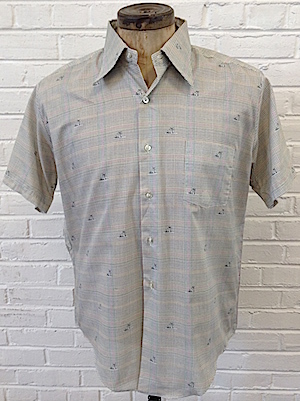 Mens vintage 1970s disco short sleeved shirt. 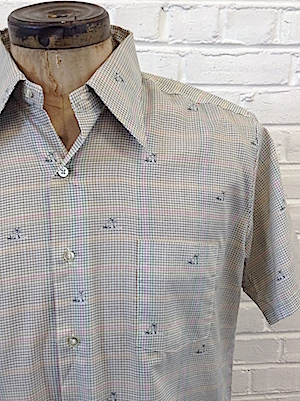 White base with a small tan, magenta, yellow, tan and green windowpane plaid with tiny little gray windmill images! Shirt has a super wide & pointy disco era collar. Closes in the front with pearly white buttons. Shirt has a tapered hem with one chest pocket. Tagged by Custom Fashions. Polyester/Cotton blend. Made in the U.S.A..